NORMAN, Okla. (AP) - A suburban Oklahoma City police officer picked up an unusual subject found wandering along a rural road. 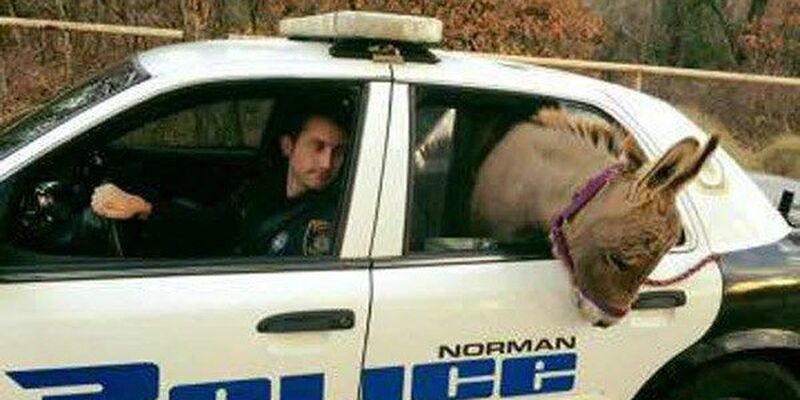 Norman police Officer Kyle Canaan says it took a little pushing, pulling and some animal feed, but he got the miniature donkey nicknamed "Squishy" into the back of his patrol car and out of harm's way Tuesday morning. Canaan responded after a woman found the animal on the loose. She told local media she had a pen to keep the donkey in but no way to get it there. The officer tells TV station KFOR the animal fit perfectly in his vehicle. He says, "I rolled the window down for it." The woman who found Squishy says if an owner doesn't come forward, she plans to keep the donkey.